Miyajima Shrine in Snow. 1935. Wood block print. Image from here. 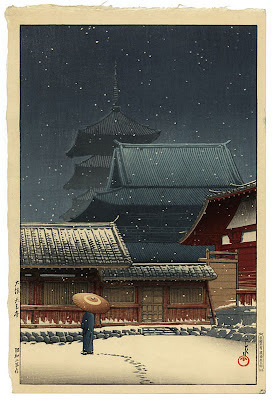 Kawase Hasui (1883-1957) is a well known woodblock artist from Japan. Most of his printmaking work is of landscapes of places around Japan based on his many watercolors and drawings in his sketchbooks. A very prolific artist, he created over six hundred print designs. Many of Hasui’s early woodblocks, considered to be his most original work, were destroyed in an earthquake making the prints before 1923 rare. Woodblock print. Image from here. His style is of shin hanga, which was a revitalization of ukiyo-e. The shin hanga movement promoted the idea of the artist expressing and creating himself. It also was inspired by the European Impressionist movement’s focus on the effects of light and mood expression. 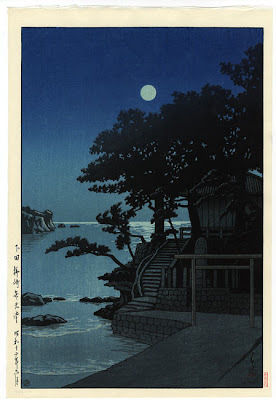 However shin hanga still focused on traditional imagery of landscape, famous places, women, actors, birds and flowers. Kakizaki Benten Shrine, Shimoda. 1937. Hasui’s work filled an entire room in the VMFA. 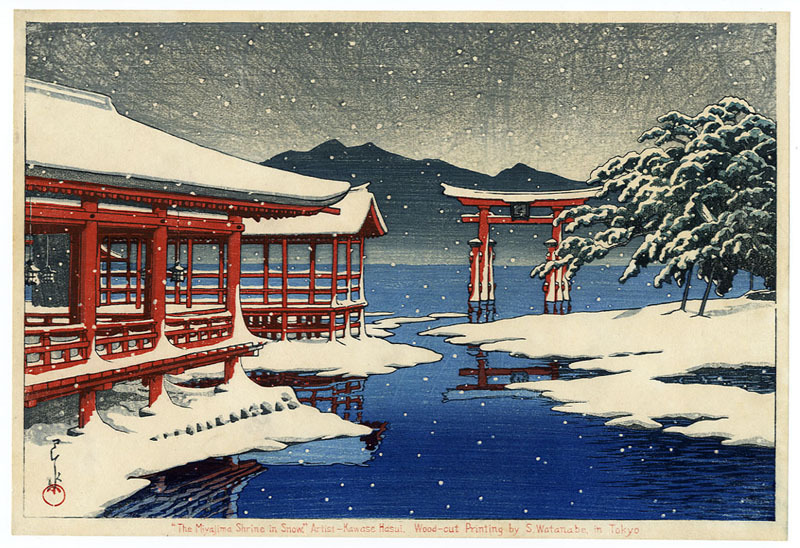 His beautiful designs remind me of other Japanese woodblock artist, such as Utagawa Hiroshige, because of the variety in atmosphere and weather. I love the asymmetrical designs that focus on nature and the beauty of Japanese landscape. My favorite work was the Kakizaki Benten Shrine, Shimoda. The night scene is poetic and serene. You can almost hear the waves lapping at the shore and the cool, whispering of the trees.